Molotov cocktails and chemical bombs tied to kites and helium-filled balloons have been launched from inside Gaza for the past 78 days. The fire bombs ignite when they land on the Israeli side of the border. Low-tech tactics, but they work. 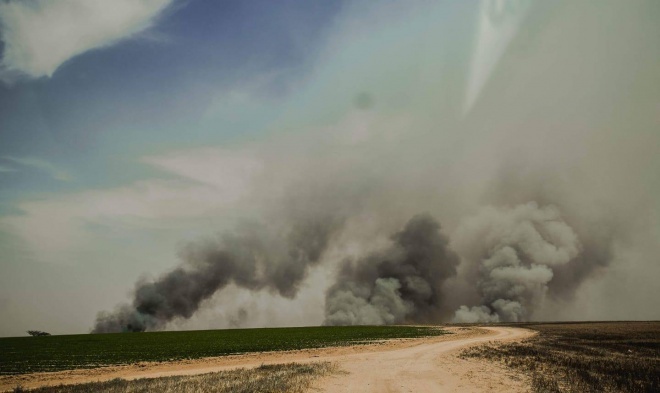 As of this writing, 412 fires have blazed in Israeli farm fields and conservation areas. Over 17,500 dunams (4,300 acres) lie scorched to the ground, at least 10,000 dunams (2,471 acres) of which are parks and nature reserves. At least one-third of Israel’s land along the Gaza periphery has suffered extensive damage. Financial damage to Israel’s agriculture already stands at $1.4 million. Food crops that could have fed thousands; irrigation equipment, and farmers’ livelihoods, have gone up in smoke. In the past 24 hours alone, 17 fires have broken out in the Gaza envelope. Hundreds of turkeys in Kibbutz Ein Hashlosha have choked to death, filling the air with the stench of burnt flesh. But eco-terrorism isn’t limited to burnt turkey runs, wheat fields, and avocado groves. The pasture that Beduin communities depend on to feed their freely roaming flocks now offers nothing to hungry sheep and goats but ashes. 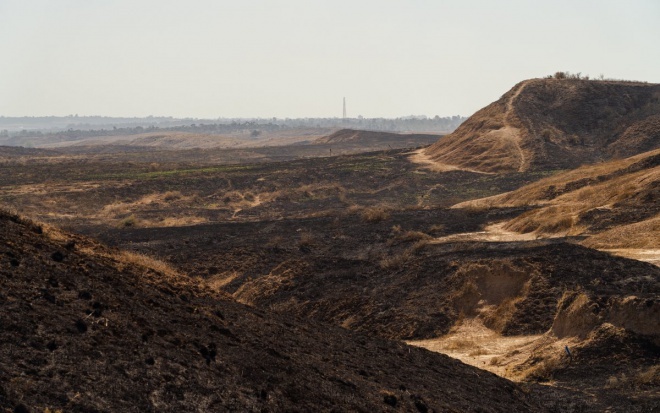 Eucalyptus, pine, and mesquite forests, each tree planted by hand fifty years ago in the Gaza periphery, are now but blackened stumps. Slow-moving reptiles and mammals trapped in the fires die horribly. 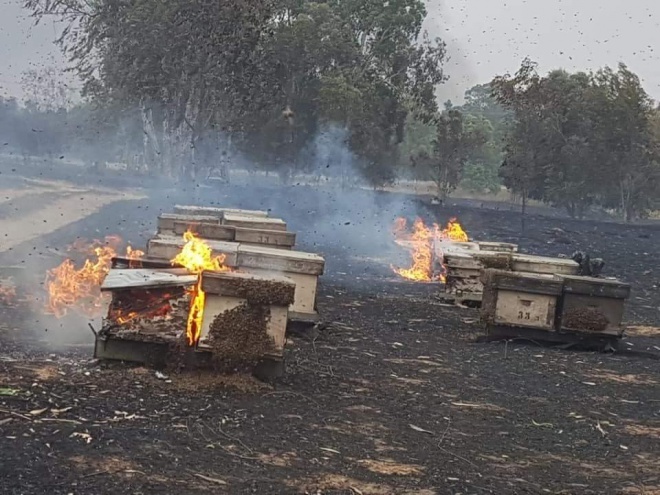 Over 40 beehives have perished in flames near Tel Gama. That means 40 fewer bee colonies to pollinate crops on both sides. Tens of thousands of tires are set on fire to create a smoke screen along the border fence for the arsonists to hide behind. With every breath, hundreds of children and adults on both sides of the Gaza border inhale air heavily polluted from burning tires, ash particles, and tear gas. The helium that keeps fire-carrying balloons floating far into Israeli land has been siphoned off Gazan hospital supplies, depriving the struggling medical system there of yet another precious resource. What will be the toll on human health? Scenes of billowing smoke, flames licking farm fields and trees, and dying wildlife, are still happening as of this writing. Arson fires have threatened a college in Sderot and come perilously close to houses. It’s been happening since March 30th. But the international press is indifferent. Green Prophet interviewed Adele Raemer of Kibbutz Nirim in the northwestern Negev, near the border with the Gaza Strip. Nirim farmers work almost up to the rim of the Gaza Strip barrier. Raemer is a teacher and teacher trainer working in the regional high school. “We’ve been lucky in Nirim,” she says. “We’ve had only three fires, all of which were put out quickly. The crops we raise by the border grow underground, such as sweet potatoes, so they survived the fires; and we managed to harvest our wheat in time. There are other, yet-unacknowledged ecological disasters happening in the Gaza strip. 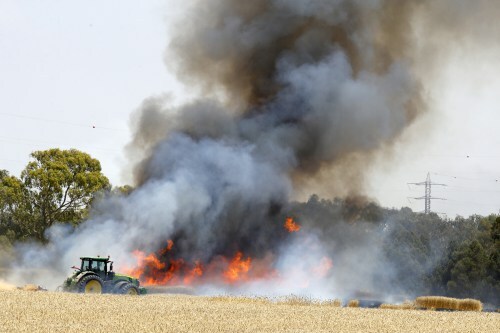 Kibbutz Mefalsim, with 2,718 acres located four kilomers from the Gaza strip, has suffered greater agricultural losses from the fire-bearing kites and balloons. “It’s horrible,” says Mefalsim resident Helen Zilser. “The fields catch fire and burn up incredibly quickly. You could be walking around and suddenly something burning will fall near you. We’re always breathing in smoke and tear gas that the IDF uses to break up violent demonstrations on the border. We have to close our windows so as not to breathe it in. “The biggest frustration is not seeing a solution to this situation. I feel that the other side suffers, and we suffer. People in Gaza are slaves to Hamas. People are people, but Hamas are terrorists. “I live in the Negev, where 98% of the residents are farmers. We have enough damage from natural causes, and now we have this. We live with fear; fear that our livelihoods will disappear, fear for personal security. On the other hand, I can’t not think that on the other side, people wake up in the morning with no bread on the table, no hope. They have nothing to lose, so they do what they’re told. Israeli authorities struggle to bring the ongoing eco-disaster to international attention. “It is inconceivable that the international community would allow Hamas not to be held accountable and pay for its criminal acts — not only against the citizens of the state of Israel, but also against the environment, which has been severely hurt by this criminal environmental terrorism,” said KKL-JNF world chairman Daniel Atar. The Coordinator of Government Activities in the Territories, Major General Yoav Mordechai, sent a letter to the head of the World Health Organization. 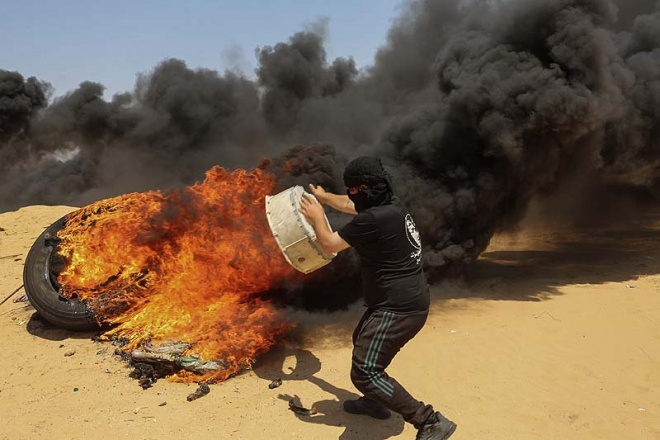 “The Hamas terrorist organization, which controls the Gaza Strip, has issued an order to burn about 10,000 tires this Friday along the border with Israel,” he wrote. “The burning of tires in such a huge quantity will cause severe damage to the ecosystem in the area, will severely harm the life, the flora and health of the residents, and will add to the severe damage to the aquifer and lead to unprecedented air pollution. Yesterday, June 17, was World Day to Combat Desertification and Drought; a day established by the UN. Israel is the only country in the world who succeeds in making the desert recede into green productivity. The same UN who recognized Israel’s leading environmental role is doing nothing to condemn Hamas for the ecological and humanitarian catastrophe in the area. This is the least-reported ecological and humanitarian disaster in the media. I am not sure where the idea came from that nobody is talking about this. A Google search showed articles from Newsweek, Aljazeera, CNN, the Washington Post, the Telegraph, Fox News, Latimes, and the Chicago Tribune and that is just a partial list. Yeah right. And how did they report it ? As we all know, the sin of omission can be as bad as the sin of commission. CNN, El Jazeera etc. are masters of how to manipulative the facts to effect how the reader / viewer views the situation. “Israel ATTACKS … ” “Israel air strikes …”. “Thousands of Palestinians injured … “. Over 30 years ago I learned how this works. To this day I still remember the specific headline when I basically lost faith in the revered till then BBC. That was the opening headline that went round the world. Who reads the small print – and if you do how do you read it when you have already been influenced by the headline? Who wouldn’t have sympathy for this poor Palestinian? So what was the story behind the death of the Palestinians? it was Purim (a Jewish holy day festival). Teenagers in fancy dress were in a parade in Tel Aviv-Jaffa. A machete-wielding 6ft 4 inch Arab attacked the parade. He stabbed to death a 16 year old girl and wounded others. Only then did someone shoot this murderer and stop his murderous rampage. Now please go back and read the headline again …. It is not world news, let’s say.